Today's topic was about how we blog but I haven't been doing that great with schedules or technology or anything blog-related lately so instead I'm going to share a couple of books that came into my house this year that would make beautiful gifts. 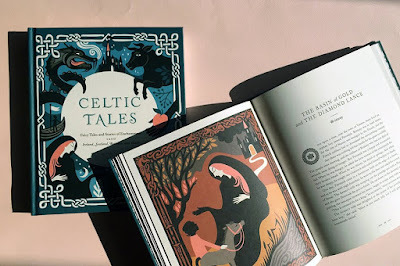 When I couldn't get back into reading after the election, I finally turned to Celtic Tales, a collection of "Fairy Tales and Stories of Enchantment from Ireland, Scotland, Brittany, and Wales". The unfamiliar stories and the beautiful artwork by Kate Forrester immediately drew me in. 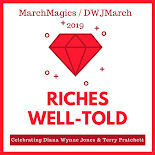 There's a great interview with the illustrator here about her inspiration, color choices, and more. I mean, looking at this picture, one is practically inspired to write their own tale, right? Each story has its own artwork and there's even a bookmark ribbon -- always the mark of a quality volume! 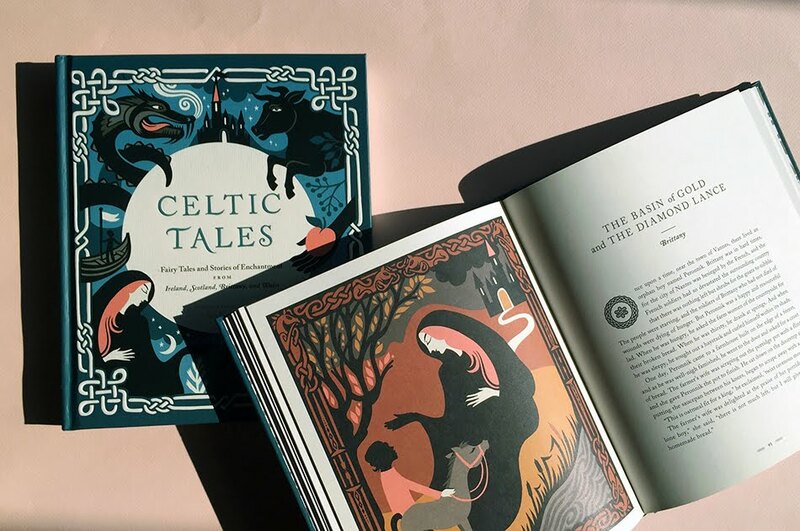 Celtic Tales would be the perfect gift for kids or adults who love tricksters, heroes, and creatures. 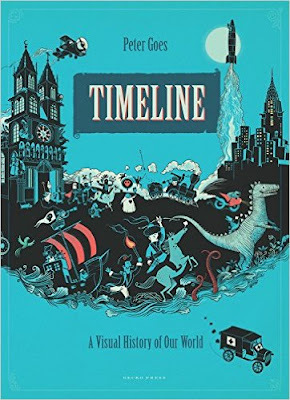 The other book I fell in love with this year was Timeline: A Visual History of Our World by Peter Goes. This is an oversized book that covers everything from the oldest marine fossils to the current turmoil on our planet. The pictures are detailed and funny and, in places, heartbreaking. Because this is from Gecko Press and translated from Dutch, it has a European slant but this shouldn't preclude American households from reveling in the beauty of this tome and learning from it. On January 7, 2015, 12 people were shot dead by Muslim extremists after the French magazine Charlie Hebdo published cartoons of the prophet Mohammed. People massed on the streets to defend freedom of speech. As you can see, this book would be best paired with an adult that is willing to answer questions and provide context for many of the things presented in the book. Nuanced situations can't be covered in two sentences in a children's book but exposing kids to the good and the bad of our history can never hurt. In fact, when I received this book, Z and I sat and went through the whole thing together, talking and laughing and learning. 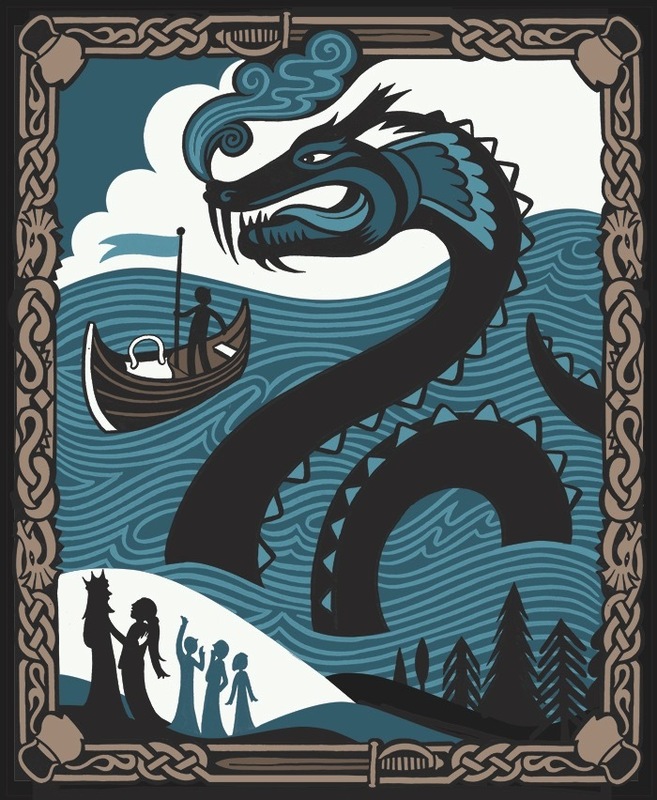 Is there a book that caught your eye this year that you think would be a good gift? Timeline looks gorgeous and fascinating. My understanding of the Ottoman empire is pretty slim: I could use a book like this! It's got so much stuff in it. Definitely a lot of jumping off points to do more research and reading! I don't think there's anything inappropriate for any age in Timeline but some of the stuff in it (war, hate) is pretty intense. I think the age range for it will vary based on the individual kid and how sensitive they are. 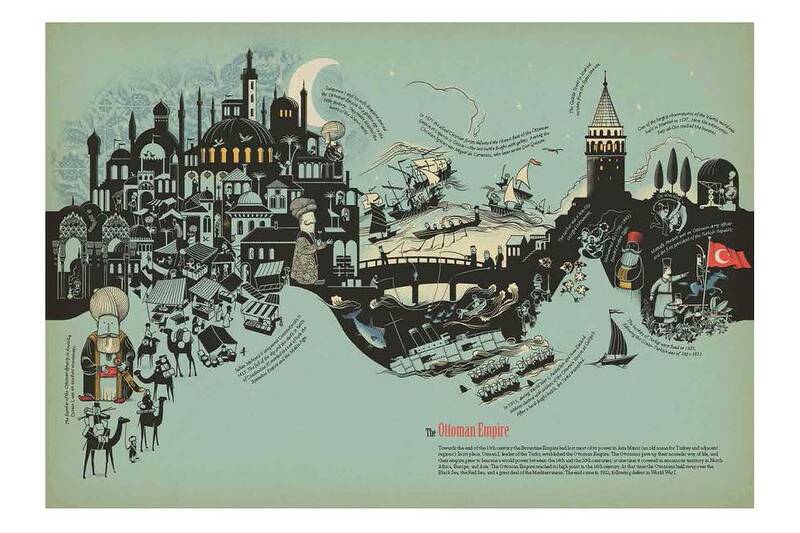 The Ottoman Empire page is gorgeous! I'd probably want the art all over my wall rather than in a book. I wish I had more readers on my Xmas list! The pages would definitely make beautiful art. I even saw some of them when I was searching for this that had the text taken off of them so there was just the art.